Subaru’s 4x4 Outback Makes Real Sense! Right from the first four-wheel-drive Subaru Estate that I tested sometime in the 1970s I have appreciated the logic of such a car. That original Subaru had an immensely efficient all-wheel-drive system that made some rivals appear more than a touch agricultural and this innovative car maker has continued to develop and improve the system. It was put to good purpose in the Monte Carlo rally winning Impreza and has stayed the course in the Subaru range, notably the Legacy Estate/Forester/Impreza and the latest Outback model that I have been test driving. 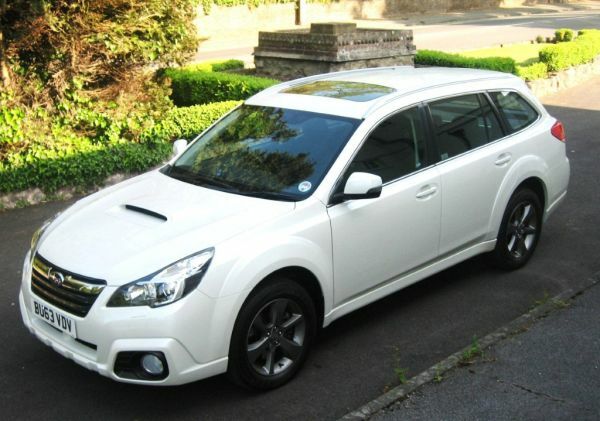 Clearly derived from the Legacy Estate but with subtle suspension changes, including a slightly raised ride height, the Outback is powered by Subaru’s iconic flat-four-cylinder ‘Boxer’ engine that has long been praised for its massive flexibility and its logically low location under the bonnet of all manner of Subaru models. For some considerable time this engine could only be available as a petrol version and was not exactly the most frugal of units in the early days. Now with the development of a diesel turbo version a few years back and on-going development, the Outback’s appeal is much more competitive. This car is what they call a ‘soft off-roader’ rather than a serious mud-plugger but its handling and traction abilities are mightily competent, able to tackle some loose gravel tracks, able to keep traction on wet grass, soft muddy surfaces, soaking wet roads, soft snow and can also deal with the suddenly varying grip aspects of an icy road. Importantly, this impressive driving performance is accompanied by a comfortable riding car (on Yokahoma road tyres) with light positive controls and very muted noise levels. OK I do enjoy the occasional exhaust grunt from that willing Boxer engine! For size it shapes up to that of an average family estate car with comfortable and generous space for five adults, an acceptable load capacity with all seats in use, greater practicality if the 60/40% split folding rear seats are utilised completely or partially. The driving position is easier to access than that of a loftier Sports Utility Vehicle of a big 4x4 and the powered seat adjustment and fully adjustable steering column provide plenty of scope to suit varying driver body profiles. Lateral support in the driving seat is good, perhaps the seat cushion might prove a bit short for those with longer upper leg proportions. Positioning of the rally-type alloy pedals proved comfortable – driver vision forwards is also very good though the rear view camera is a tad small. Facia presentation and layout is smart, easy on the eye and indicative of the high standard of product quality and finish of the entire vehicle. Smart slatted leather upholstery is a prime example of the high trim standard that Subaru has achieved. The 149 bhp engine just has to be experienced, it is so willing, so refined and works virtually silently in conjunction with a seamless changing responsive automatic transmission (serious drivers might opt for the 6-speed manual alternative) and works well with the cruise control. Performance is lively in a smoother manner, Subaru claiming a top speed of 121 mph and acceleration to 62 mph (100 kph) in a respectable 9.7 seconds. Intermediate speed pick-up is a strong factor. Fuel consumption is a reported 44.8 mpg on the combined cycle, I would suggest that mixed use, perhaps loaded and utilising roof rails would drop that closer to the 30 mpg mark but that’s still good for a car of this size and with AWD. By virtue of its more conventional body shaping the Outback is a good motorway vehicle, avoiding buffeting and is very stable in cross winds, the AWD system also ? ?adds to that stable feel and also contributes towards speed control – often it is a simple act of lifting off the throttle a touch to shed pace rather than touching the brake pedal. Getting going up a gradient is also made easier by the inclusion of a Hill Hold system and an automatic electric parking brake. Other items of note include much better than average oddments stowage, a sun roof, efficient air conditioning, four grab handles above the doors, alloy wheels (no spare wheel but a repair kit though there looks like room for at least a space saving spare wheel) plus the usual in demand audio, communication and entertainment systems. The Subaru Outback may not make the same sort of statement as a large 4x4 (which can be derisory at times!) but I think it can have the edge where road/parking space is tight and the terrain could turn challenging. A Subaru Outback with perhaps winter tyres could make a lot of sense. MAIN RIVALS: Audi A4 Avant Quattro, Skoda Octavia Estate AWD. VW Passat Estate 4-Motion. TOYOTA: Modern cars are great for gadgetry designed to make the user’s lot an easier task but information culled by leading car maker Toyota suggests otherwise. Earlier cars had few items to distract the driver, now a driver can be surrounded by all manner of devices, some easy to live with, others perhaps a bit more challenging to use and potentially a distraction. Toyota is in the process of developing a less distracting driver situation, creating a car that can function like a tablet, recognising the driver’s individual requirements for a given journey and producing the required information, be it a personal schedule, weather conditions or where fuel can be obtained. Currently Toyota has developed a working prototype car involving a Microsoft Surface tablet and Kinect motion-sensing technologies. It is installed in a DARV 1.5 working prototype car, and can also measure driver behaviour and even recognise who is the driver.